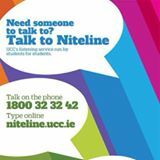 Niteline is a student-run non-profit organisation that provides free emotional support to students in distress. Totally confidential and non-judgemental. We are here to listen and no problem is too small. We operate every week from Monday through to Thursday from 9pm to 1am. Contact us at any time via our facebook or twitter or email. Each September the Niteline Assiciation here in UCC recruits new members. © 2019 Cork Niteline. All rights reserved.